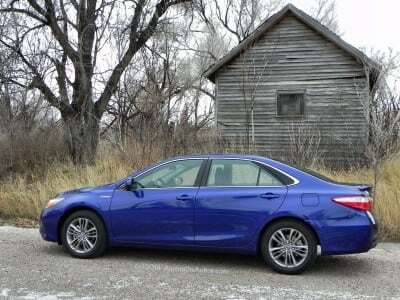 Toyota gave the entire lineup of Camry sedans a new look and drive dynamic for 2015, but left the powertrains alone. In the 2015 Toyota Camry Hybrid, this means the efficient sedan has a great new style, but doesn’t sacrifice that which has made it a favorite. We saw the new 2015 Camry Hybrid and its gasoline-only brethren briefly at an event Toyota hosted a few months ago. Now we’ve had the chance to drive it more extensively in the favored Hybrid model at its new mid-trim level. For the gasoline-powered XLE, click here to read what Jimmy Dinsmore had to say. 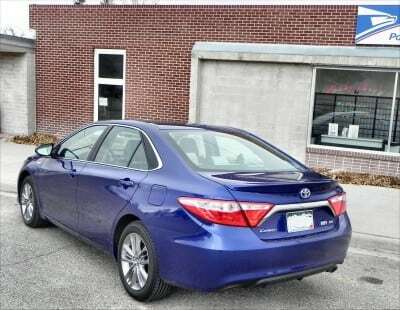 Frankly, the redesigned Camry introduced in 2013 was a flop. It featured plain slab design elements and the driving dynamics of a 1980s Buick. 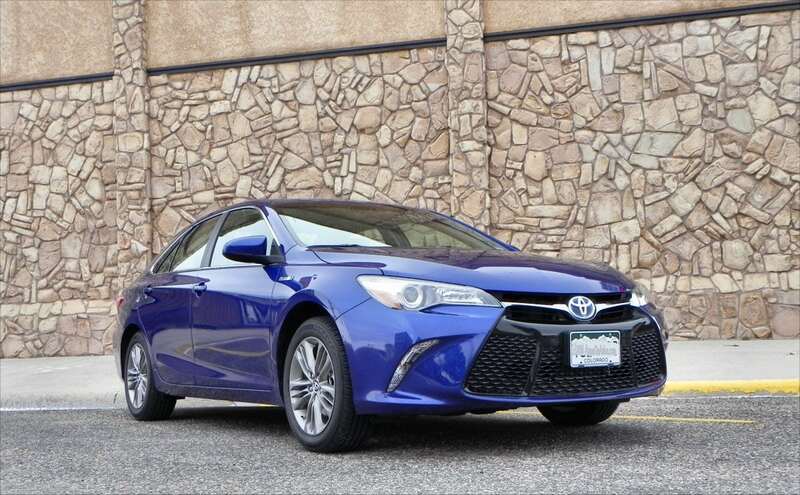 For 2015, the Toyota Camry Hybrid sees a total body redesign, improved handling characteristics, and a new, mid-level trim option. All welcome and much-needed improvements. Toyota expects the buyer take rate for this new Camry Hybrid to jump from the current 10-12 percent of sales to about 15 or so. After driving it, we think it should be even higher. 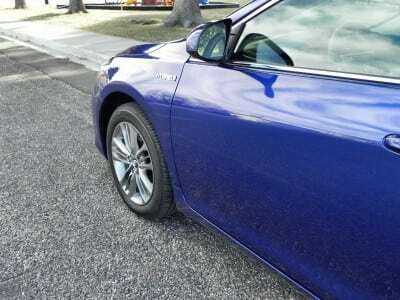 The new style for the Camry’s exterior is far more modern and current. With competitors hitting high marks for their looks, Toyota was forced to rethink the Camry or begin losing market share for their chief money maker. On the style front, Toyota really delivered. 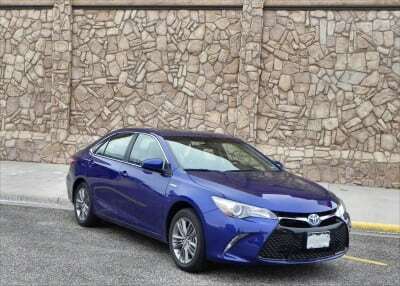 The look chosen is bold by Toyota standards, but, as is signature for them, only about middle of the road compared to the dynamic styling now defining the midsize sedan market as a whole. This, of course, is why the Camry has always been a best-seller. It is not too hot and not too cold. Toyota specializes in baby bear’s porridge. 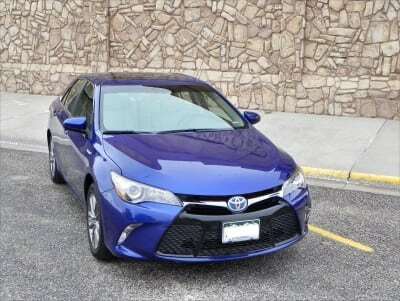 The new 2015 Camry’s styling begins with a larger, more aggressive grille and sharper fascia. Sculpted body sides with character lines accentuate the same across the hood. The rear is tighter and incorporates a more sophisticated integrated spoiler. It is a great look as a whole, making for a far more dynamic new Camry. 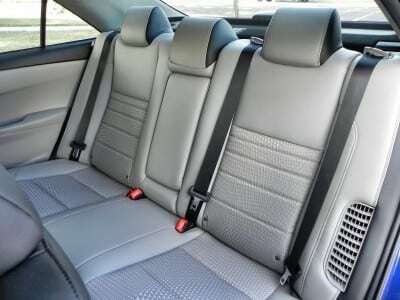 A new sport trim, designated the SE, is added, making for three trim options in total for the 2015 Camry Hybrid. The others fit to either side of that as the base LE and the posh XLE. 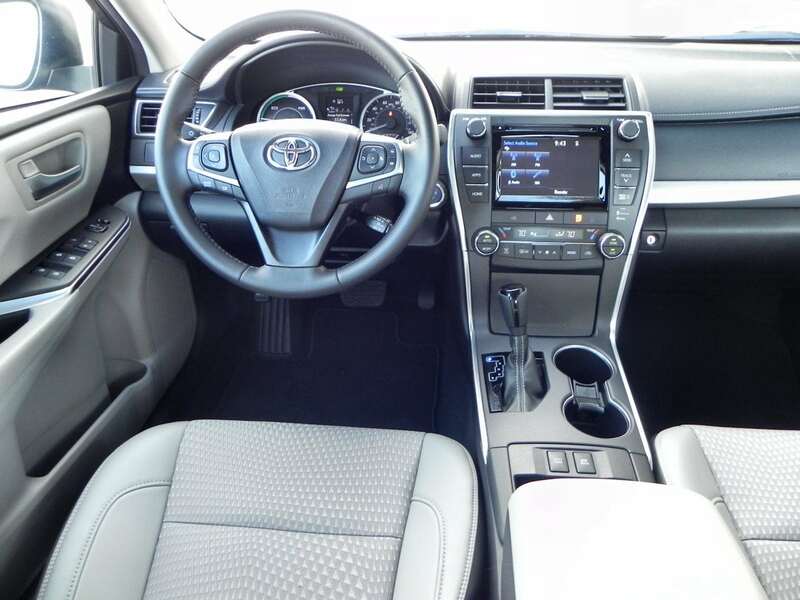 The Camry Hybrid LE trim has basic amenities and starts things off with a good foundation of standard equipment. This includes automatic headlights, full power accessories, Bluetooth connectivity, 6-speaker stereo sound, and USB/iPod plugs. The SE, which we drove, has the LE package plus unique fascia treatments, 17-inch alloy wheels, a more sport-tuned suspension, a larger rear spoiler, and more. Several options are also available, many of which our test loan included. 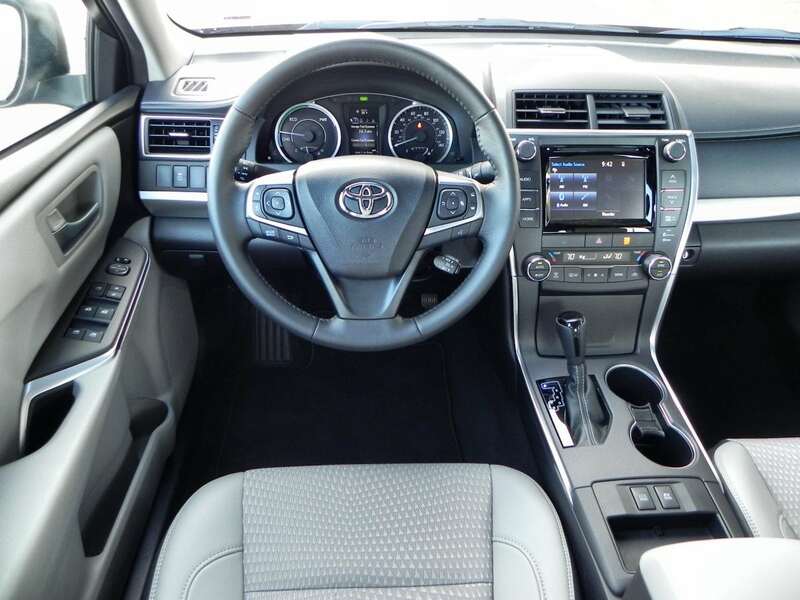 The Camry Hybrid begins with a 2.5-liter four-cylinder engine which couples to a continuously variable transmission (CVT). Also on that CVT are two electric motors. One acts to propel the car either alone or in concert with the engine. The other captures both braking and extra engine power to charge the small onboard battery pack. 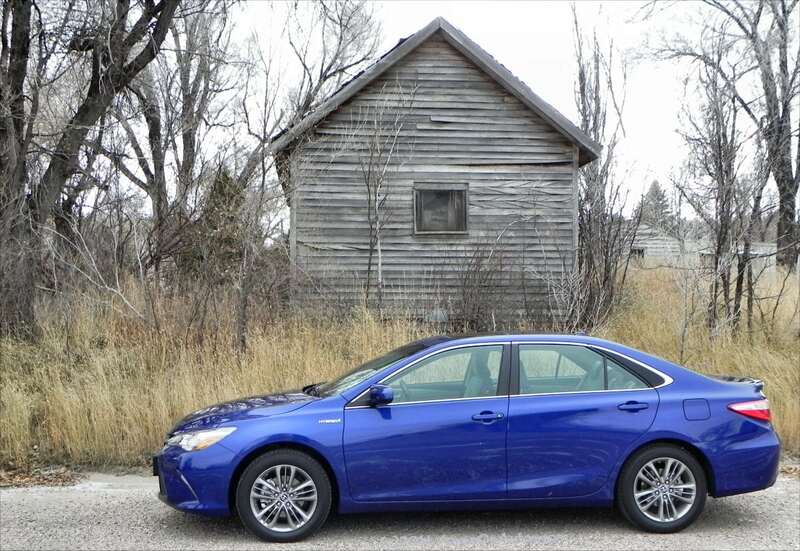 Little has changed as the EPA rates the new Camry Hybrid with the same impressive 41 mpg combined the previous model had. 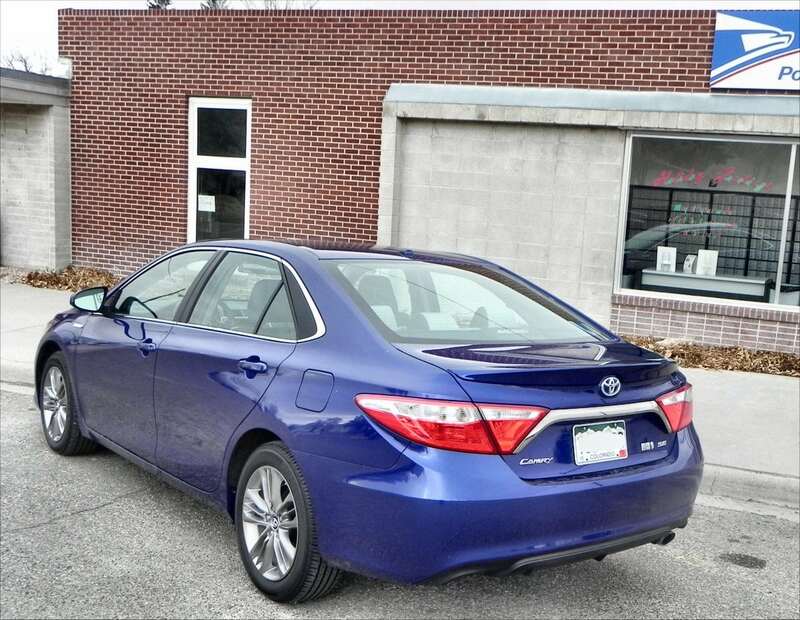 Those familiar with the 2013 or 14 Camry Hybrid will still enjoy the 2015. 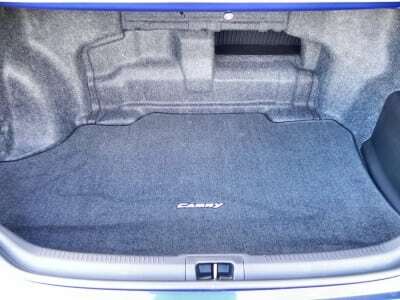 It remains spacious and ergonomic. The dashboard has been lifted to give more space, though, and materials quality is improved as well. There are no cheap plastics in the Camry, even at the base trim. The trunk is also still one of the biggest in the business, though the Hybrid model loses some space and function to the batteries as before. 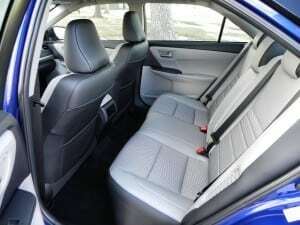 The rear seats have a 60/40 split, even in this hybrid model. 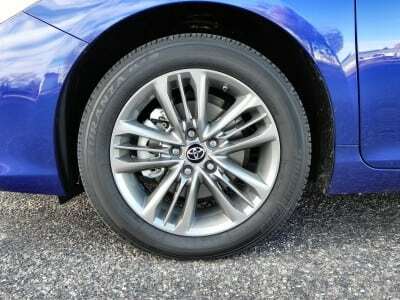 The hybrid version of the Camry has always held the better road dynamic of the model line. The new 2015 is no exception, though this new sport trim boosts that even more. It is not as cushy as the others, having a slightly tighter suspension and better steering response, but sacrifices a bit of comfort for that. 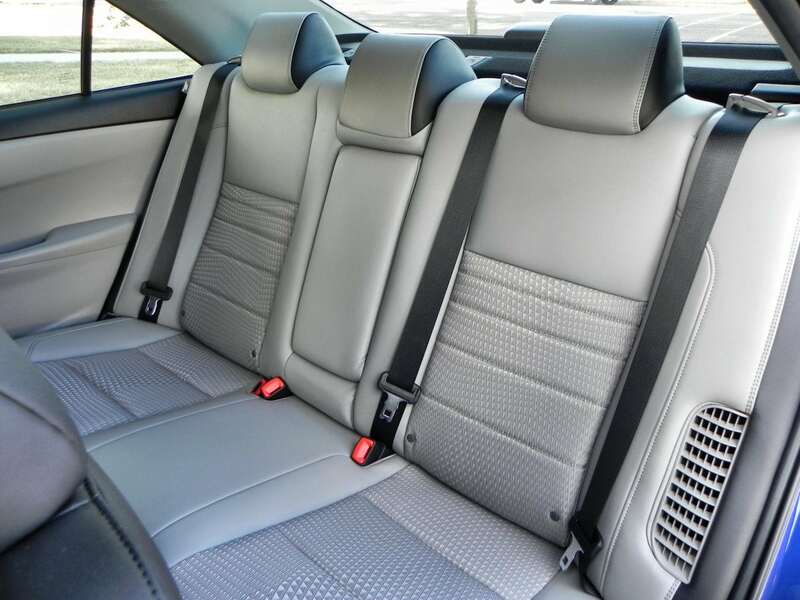 That is not for everyone, of course, but the LE and XLE trims offer a more cushioned ride to accommodate. We found the Camry Hybrid SE to be a fun daily driver that doesn’t sacrifice efficiency or versatility to be so. An enjoyable car that may not quite be “sporty,” but that is certainly more engaging than the norm. The midsize hybrid sedan market has no lack of entries vying for consumer attention. The Camry Hybrid pits against the prettier Ford Fusion Hybrid, the sportier Honda Accord Hybrid, and the cheaper Hyundai Sonata Hybrid. Of these, only the Ford really competes as an all-around package of looks, efficiency, and cost-effective choice. The new Camry Hybrid trim options, however, slide that last metric more towards the Toyota’s favor. Efficient and well-made with few detractions. A good drive in every trim level. Not as standout as others, but not as weak as some either. This could be a strength. Hybrid efficiency is becoming average rather than leading. However you slice the new Toyota Camry, it’s a well-done car. The design is good, the interior is great, and in this hybrid model, it’s fuel-efficient and it drives well. A nicely rounded car that epitomizes everything great about Toyota. The 2015 Camry Hybrid was a manufacturer’s press loan given to us for about a week. During that period, we put a total of 229 miles on the car, including cold weather, highway, and freeway driving as well as an in-town mix.